LPC8 is a spark ignition engine management system, presently capable of fully sequential operation (injection and ignition) on engines with up to 8 cylinders. Shares architecture and most features with the LPC4 but has more capabilities. See product's home page for more information. Also suitable for body electronics control or instrumentation. You can select optional input amplifier modules for the crank and cam position inputs at order time. These are necessary for some engines equipped with variable reluctance sensors but not all. If your engine has VR sensors and you are unsure, getting the module is the safe bet. If you are unsure what kind of sensors your engine uses, contact us. 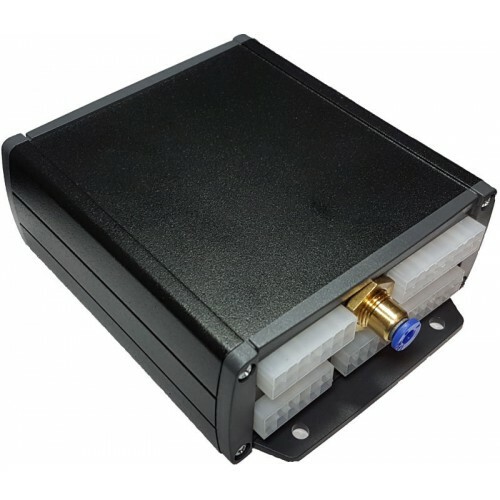 This unit has a built in controller for a wide band lambda sensor so we'd suggest also getting the LSU4.9 sensor and connector to complete the package, but are leaving it optional in case you'd like to use a different sensor. This is an input amplifier module that enables the LPC4 to reliably trigger off poor quality VR sens.. This is a MAC Valves Inc. 35A-ACA-DDBA-1BA three port solenoid valve suitable for turbocharger boost.. The ITM8 is a power transistor module designed to drive up to 8 passive ignition coils (those withou.. This is a genuine Bosch LSU 4.9 lambda sensor with 1 metre long cable and small D shaped connector. .. This is the premium OBD2 to Bluetooth adapter on the market. There are other lower cost options but .. This is an OBD2 connector with mounting flanges on two sides, perfect for retrofit if your car does .. Perfect for engine swaps, this sensor is easily adapted to any cable operated accelerator pedal to c..
Part number GS100502, this is the formerly Cherry, now ZF Electronics gear tooth sensor.12mm diamete.. Perfect for exhaust manifold pressure or boost pressures up to about 5.5 bar at sea level.This is a ..